I’m not very good at growing herbs so I cheat and buy the pots of fresh herbs from the supermarket. 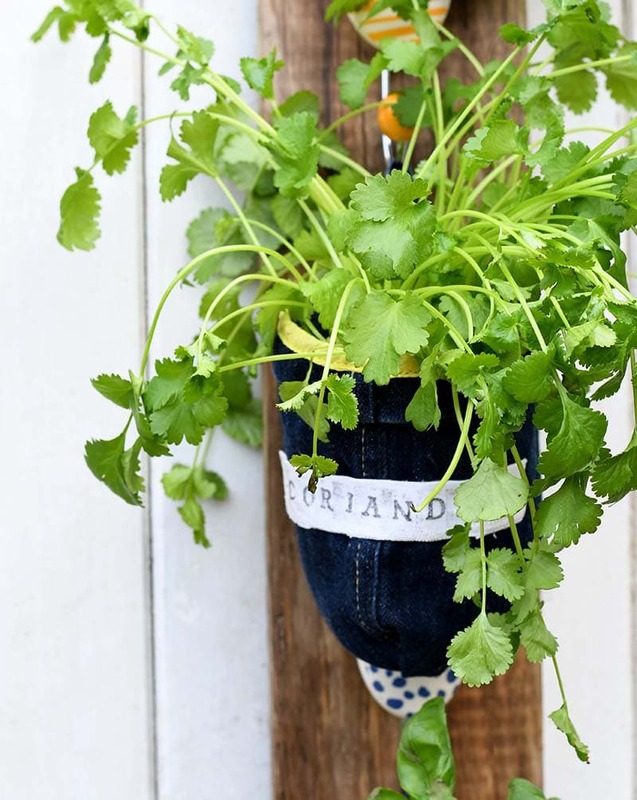 This week I made vertical indoor herb garden planters out of denim for these pots of herbs. The herbs now hang vertically next to the cooker so they are handy to reach when cooking. I love to just grab a handful of fresh coriander (cilantro) and bung it into a pot of freshly cooked curry. 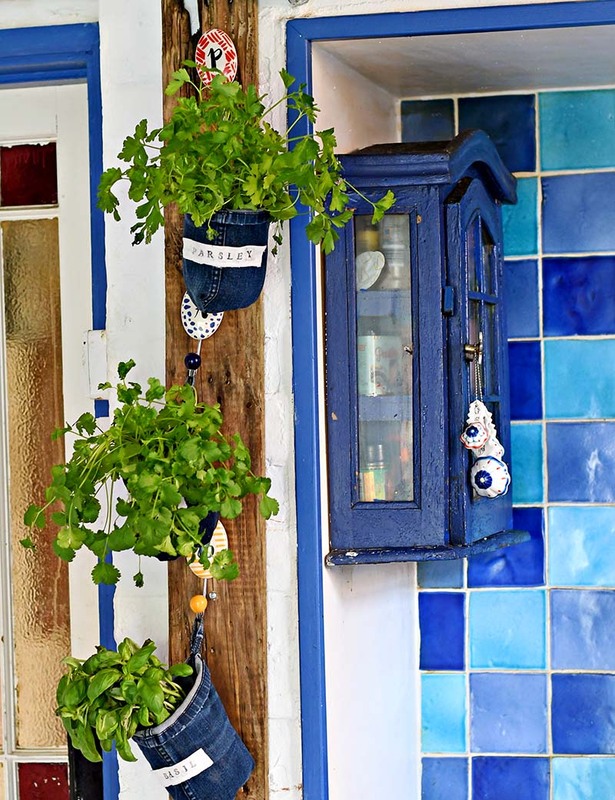 As well as looking good, the herbs in these handmade planters last longer as they are double potted which allows for easier watering and drainage. For now, I’ve made planters for 3 of my most used herbs, coriander (cilantro), flat-leaved parsley and basil. In the summer I will need to add another pot just for mint for all the pitchers of Pimms and Mojitos I love to drink when the suns shining. Denim legs – I made 3 planters so I used the bottom of three jeans legs. Three hooks – I used some painted ceramic hooks that I already had. 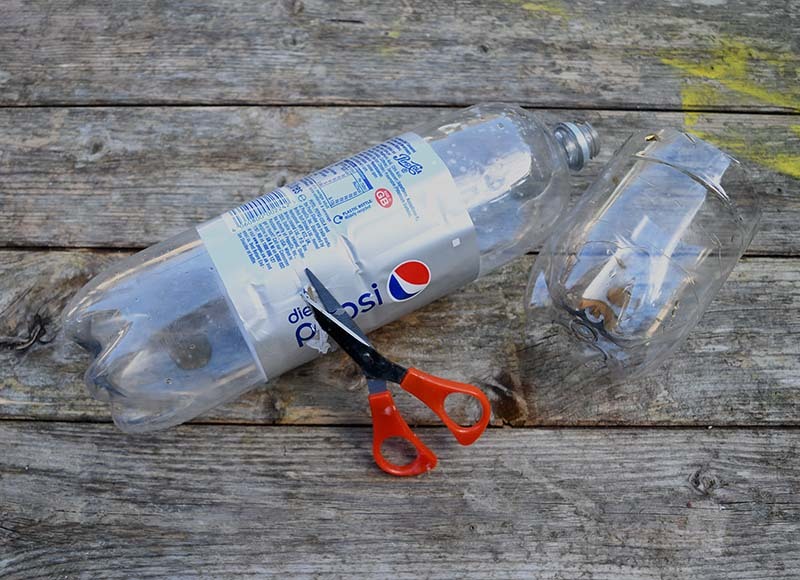 Using scissors cut the bottom off the soda bottles. So you end up with a cup approximately 15cm (6″) high. Next to make the denim herb pockets. 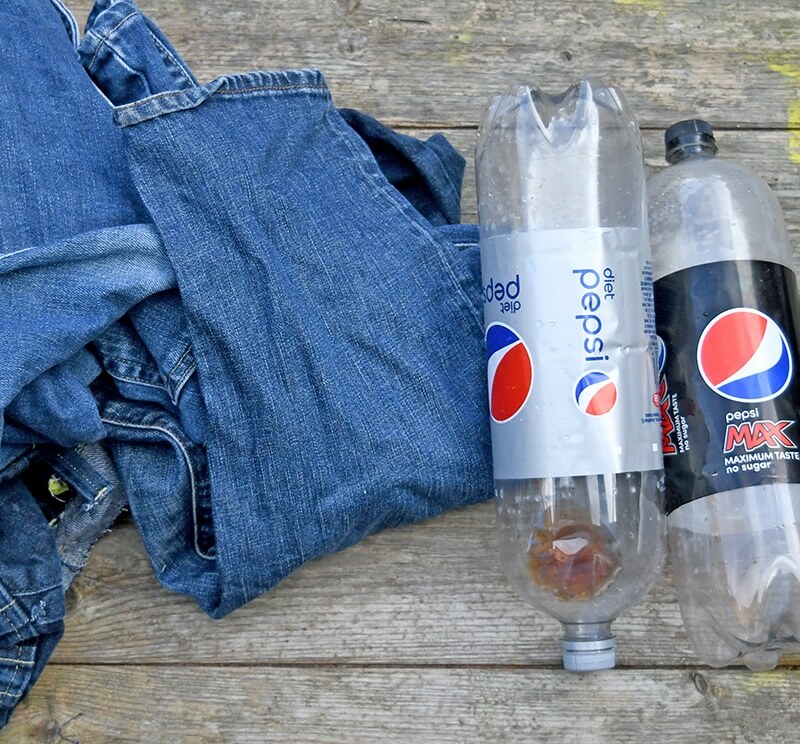 Cut the bottom off a jeans leg about an 1″ longer than the cut soda bottle. Turn this inside out. Cut the bottom corners to make it more rounded and then stitch up the bottom (this can be done by hand or even glued if you don’t like sewing). Turn the denim pouch right side out and then stitch a belt loop from the jeans to the back. Finally, place the soda bottle bottom into the pouch. To add a bit more interest to the denim pouches I made some herb labels. 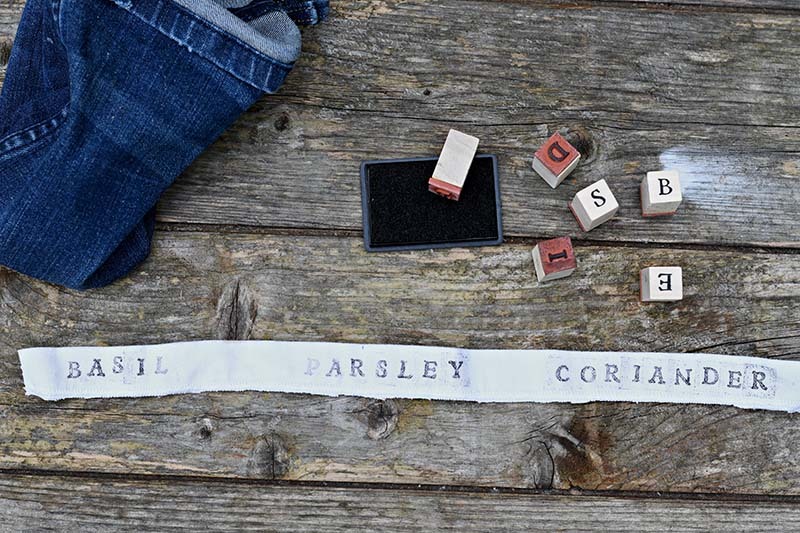 I stamped the names of herbs onto a strip of white fabric. Then cut these labels out and glued them to the front of each denim pouch. 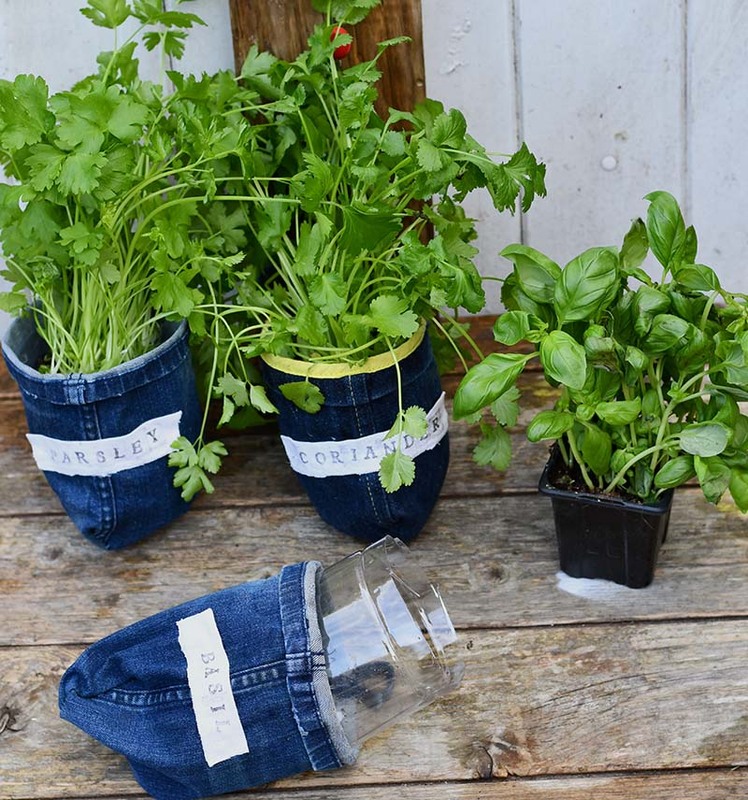 I then simply put the herb pots I bought from the supermarket inside the denim herb planters. As the pots sit in the soda bottles they can be easily watered and the excess water has somewhere to drain. Finally, I made a simple hanging post for the indoor herb garden planters. 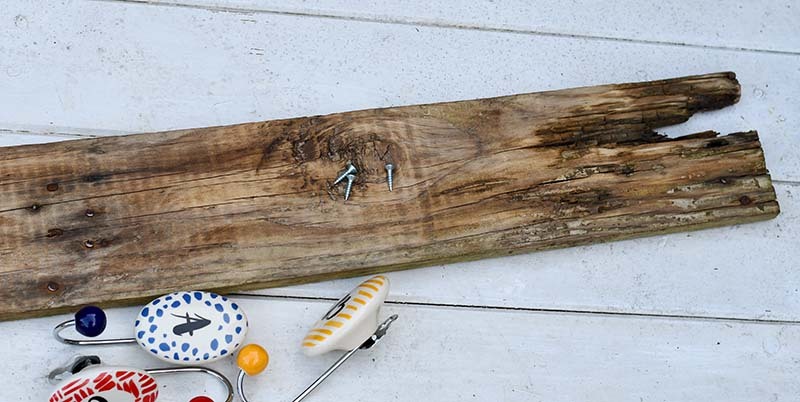 I sanded and waxed a plank of old pallet wood. I then screwed 3 hooks into the wood one for each herb pot. This was verticle indoor herb garden was then simply screwed to the wall in my kitchen. The only reason I hung my indoor herb garden planters vertically was that I had the perfect strip of wall for them in my kitchen, between the door and the cooker. 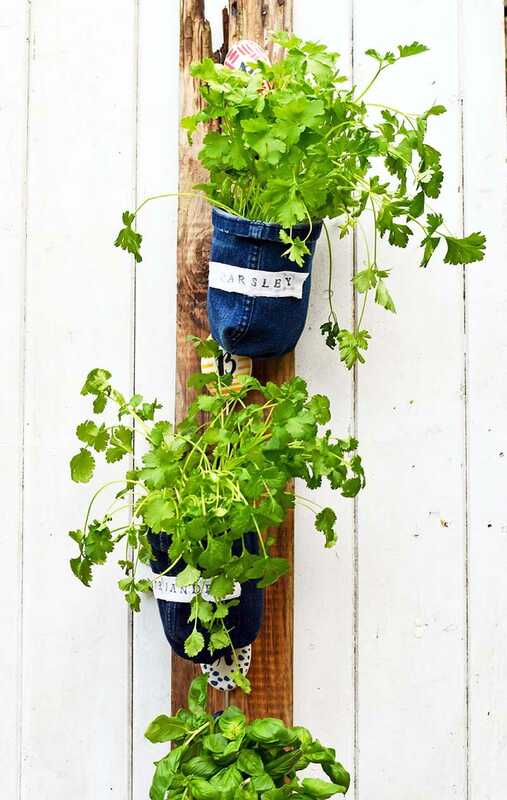 It is so easy to turn the plank round and have a horizontal denim herb planters if that’s what you need for your space. 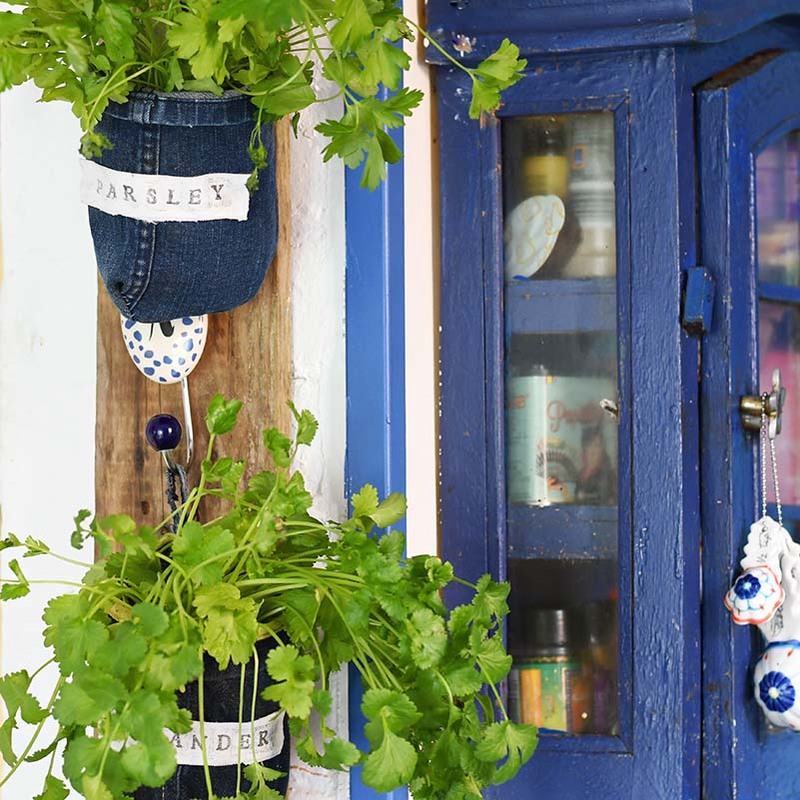 Whichever way you hang them, not only is it handy having the herbs to hand they do make the kitchen look more organic. Plus I find my supermarket potted herbs last that bit longer as they are now double potted which helps with the watering and drainage. If you asked for cilantro over here in England most people wouldn’t know what you were talking about. That’s because we call it coriander. As far as I know, I think that’s the only herb we have a different name for from the US, let me know if you think there is another one. This isn’t the only herb garden I’ve made. 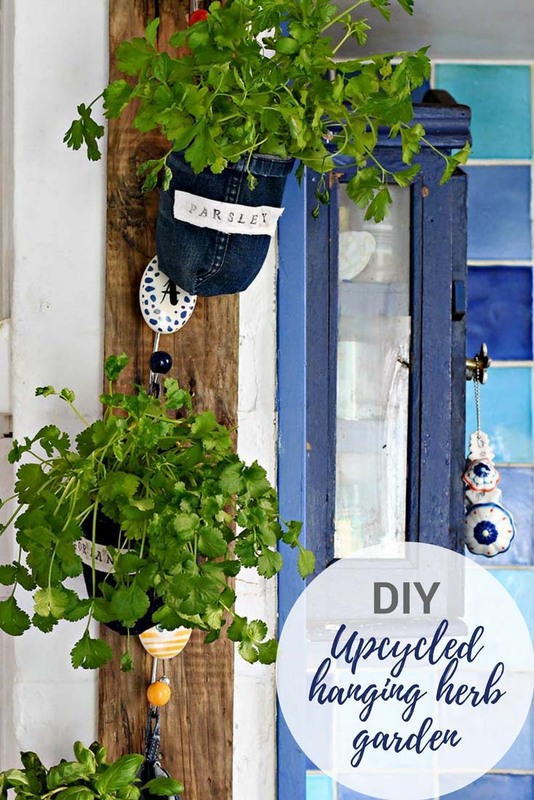 You might want to check out my upcycled window herb planter. Or if you just love to upcycle denim, check out my repurposed denim page. Or if you are looking for more ideas for the Kitchen there are some great tips on how to organize your pantry here. 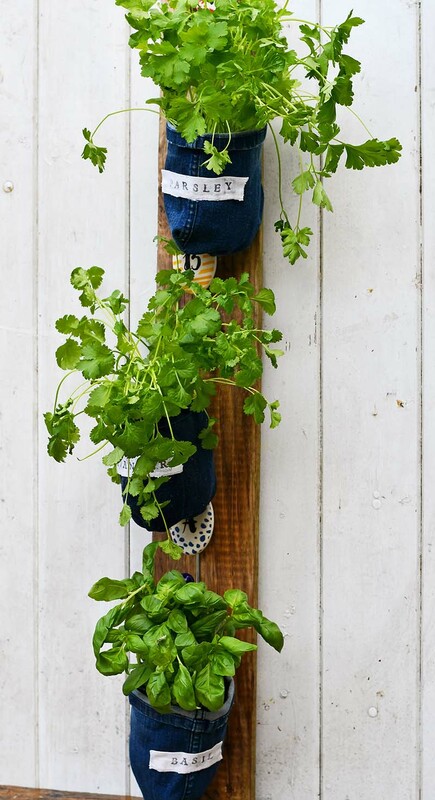 What a cool herb planter! Very creative! Wood and bluejeans the perfect match! Thank you, one of my favourite combinations. I love this and it proves how anyone, anywhere can grow a few fresh herbs. Thank you for adding this post to the #GoingGreen linky and I am so sorry it has taken me so long to pop over for a read. After a summer break GoingGreen will be back again opening on Sept 3rd. Hope to see you there … and I hope you had a fabulous summer! Thank you, look forward to joining you next week. This is so amazing such a wonderful concept; I live in an apartment complex so I’m grateful for your creative mind…Thank You! Thank you 😊. Growing plants vertically is a great option for small spaces. Thank you. I too grow herbs and flowers in old tins. I love your denim ideas, and this one no different than fabulous to. Ahh, thank you Ivory. There are plenty more to come. 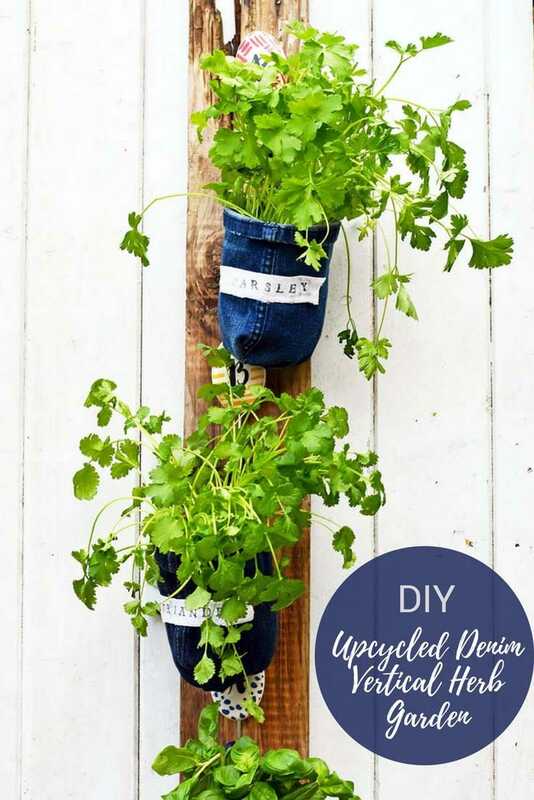 This is such a fun idea for Herb containers. It would add some blue to a patriotic decor setting too. This post will be Featured at the Merry Monday party this week. I always love your denim upcycles! Thank you, Shirley. I love crafting with denim. I’ve actually made patriotic bunting before with jeans. I love that you put the pots in recycled soda bottles to catch the extra water. 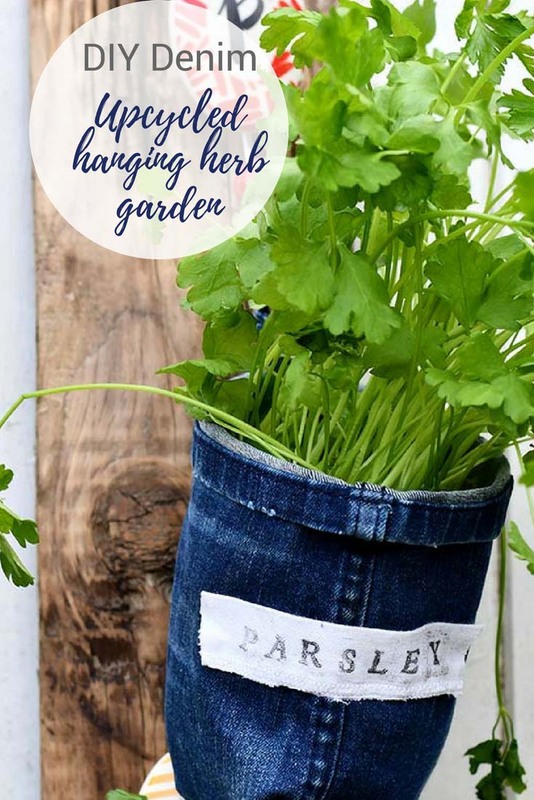 Been wanting to add some fresh herbs to our kitchen and this will be a great project to try. Thanks for sharing on Merry Monday. Thank you, the plastic pots really help keep the herbs fresh. Thank you so much, I look forward to seeing it featured. love, love, love, would be great for succulents as well! thanks so much for making craft schooling Sunday an amazing party! Thank you Sara. Everything looks good with succulents. SERIOUSLY!!!! So adorable and the bottles inside so clever! I just adore the boho feel this project has. Thank you so much, that’s awesome I look forward to seeing it. 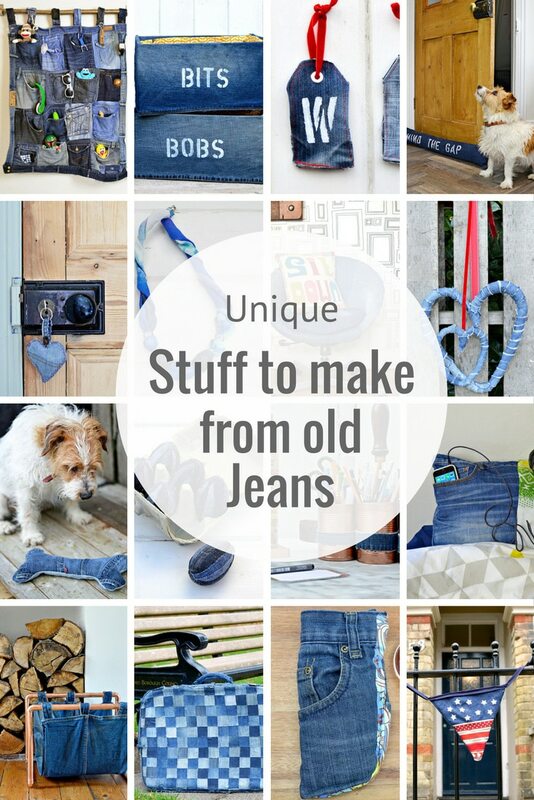 That’s lovely, is there anything you can’t make from denim?! I didn’t know that coriander was cilantro, you learn something new every day. I do remember when I first heard the different pronunciation of oregano though. I was watching near the beginning of A Few Good Men and Tom Cruise is talking about getting his client off as he was carrying a bag of O-regg-in-o and I had no idea what he meant! I had no idea he was talking about oh-reh-garn-no !! Thank you, Julia. Yeah, I find the way the Americans say oregano a bit odd also I think that basil is pronounced differently. It’s more like bay-sil with a long a sound. I bit like the difference between northerners and southerners in the UK and how they pronounce the A in words like grass and bath. Thank you so much, Michelle, it’s proving to be very handy. Claire, this is so clever & resourceful–love it! Thanks for sharing at Vintage Charm! Pinned! Thank you, Lins. Double potting these seems to make them last that little bit longer. Thank you, Susanne. The labels were a last minute thought. I’m making these . Thanks for the fun idea. Thank you and good luck with them. What a fun idea!! Thanks for sharing your tutorial. This is truly right up my alley! Love it, great share and Pinned! Thanks for sharing on To Grandma’s House We Go!